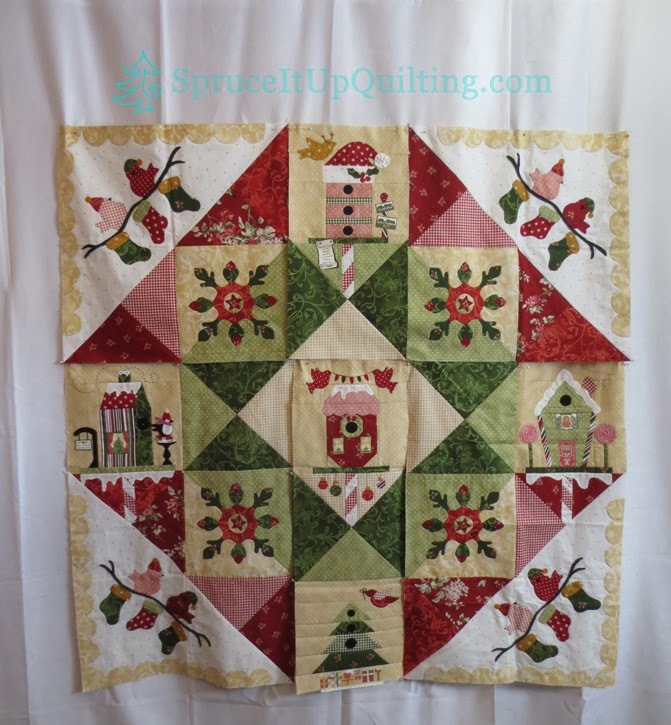 Spruce It Up Quilting: Details! 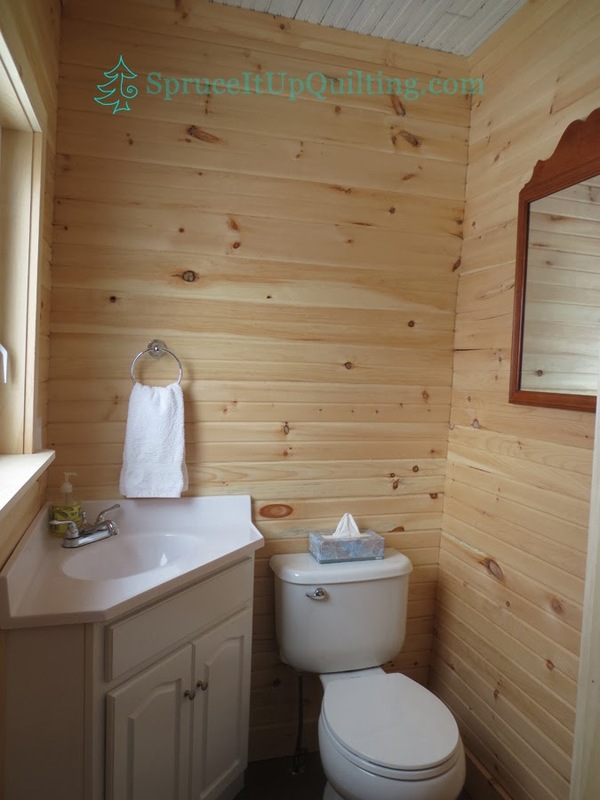 When we moved to the farmhouse in 1998 from Ontario, this small space was an ill-designed bathroom where the counter was much too tall or too big for the space and the toilet was facing the door and way too short. Both were removed and the space was turned into a closet. 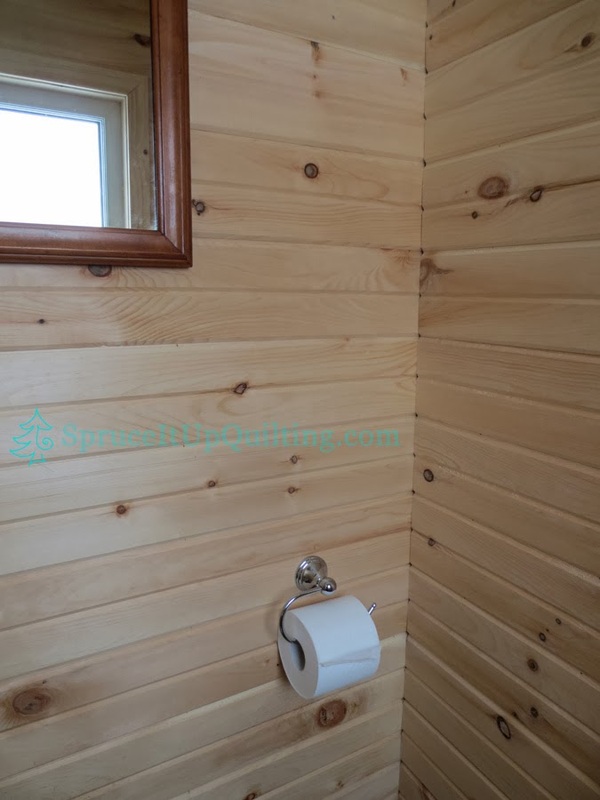 The redesign and renovation of parts of the farmhouse in time for our retirement made us decide to bring back the bathroom. 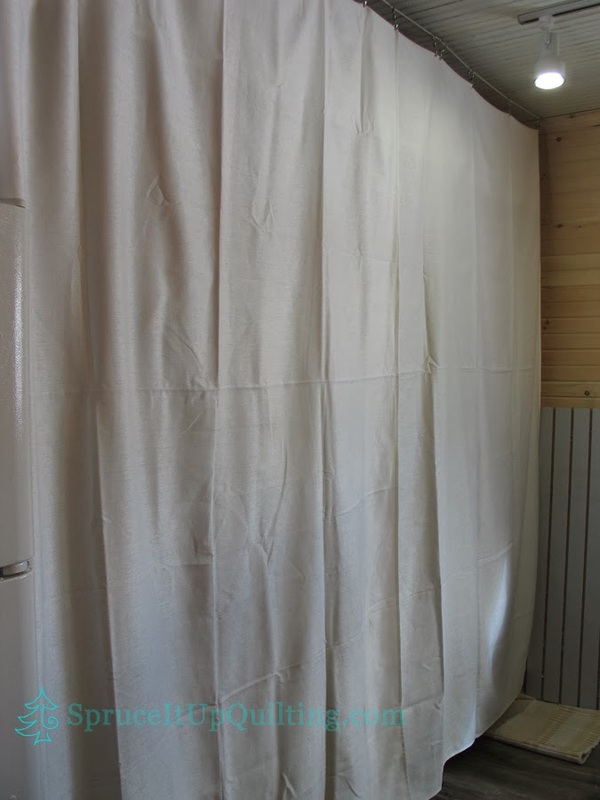 Speaking of walls, there is little room at the farm for a quilting design wall. Next to Lolah sits a large shelving unit where we've stored packed boxes that won't be touched until the future garage gets built. Storage, as I've mentioned before, is at a premium and we're trying to find creative ways to store our belongings and hide unsightly boxes. While researching curtain hanging equipment, we came across this cable system that could hang from the ceiling. It was worth a try and since it wasn't all that expensive, it wouldn't break the bank if it didn't work. I must say that my eyesight is either getting bad or the lighting here is different. Perhaps maybe both statements are true. Since I like to work at machine sewing during the day, although there hasn't been any of that since before the move, I leave my appliqueing for evening work. I already need readers but I've longed for magnifying lenses for quite some time. 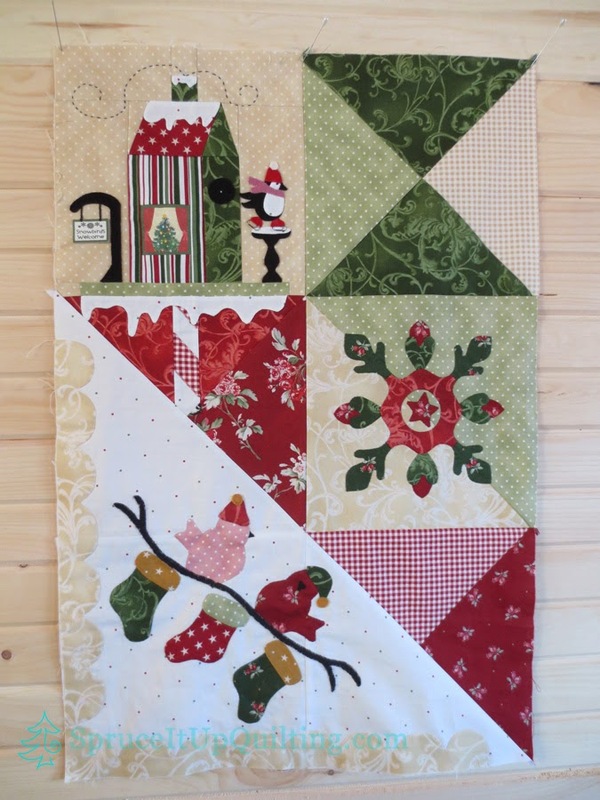 Have you seen those advertised in the quilting magazines?? The ones that cost $900+?? I would love a pair of loops but I won't spend that kind of money for them. The first is a 20X magnification pair with LED lights. They aren't suitable for my purpose. The lights are very bright though! But they're too strong and the work has to be very close to see anything clearly. 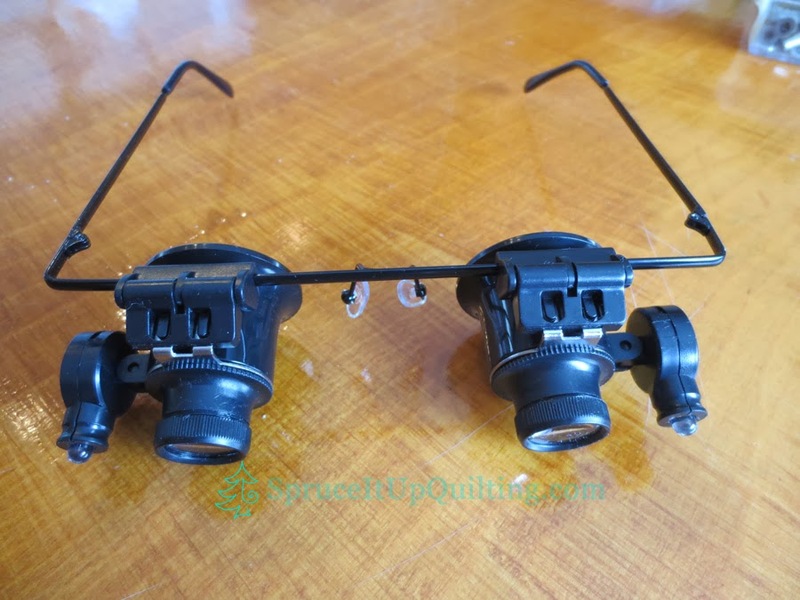 The second pair is much more suitable, it has an LED light that pivots and has an extra magnification lens on the side that can rotate into the rectangular lens to add extra close up when needed. 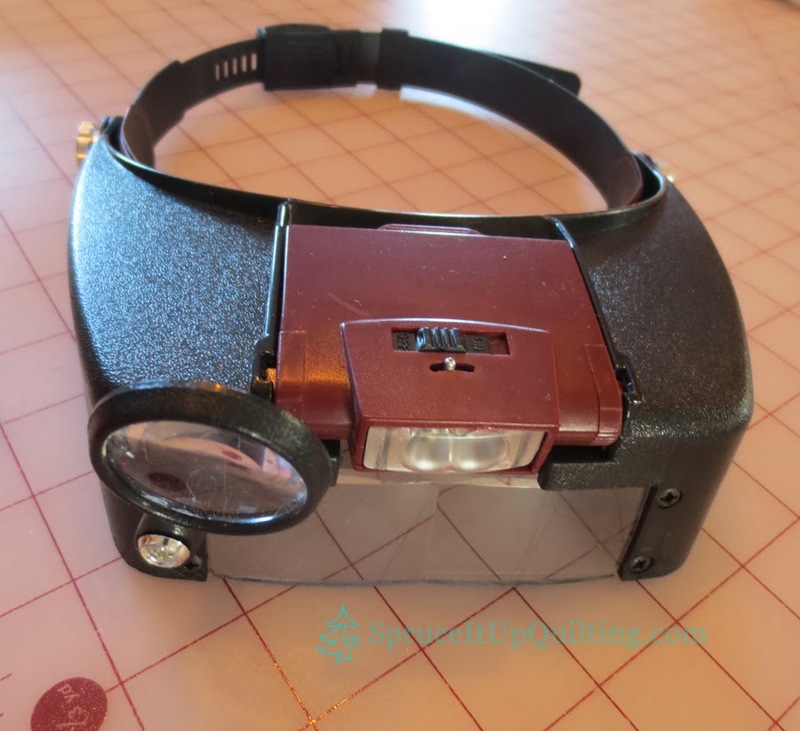 The headband is articulated at the sides with screws that tighten the "cap" to your desired reading angle and also allows you to flip it up out of the way without having to remove the whole unit from your head. 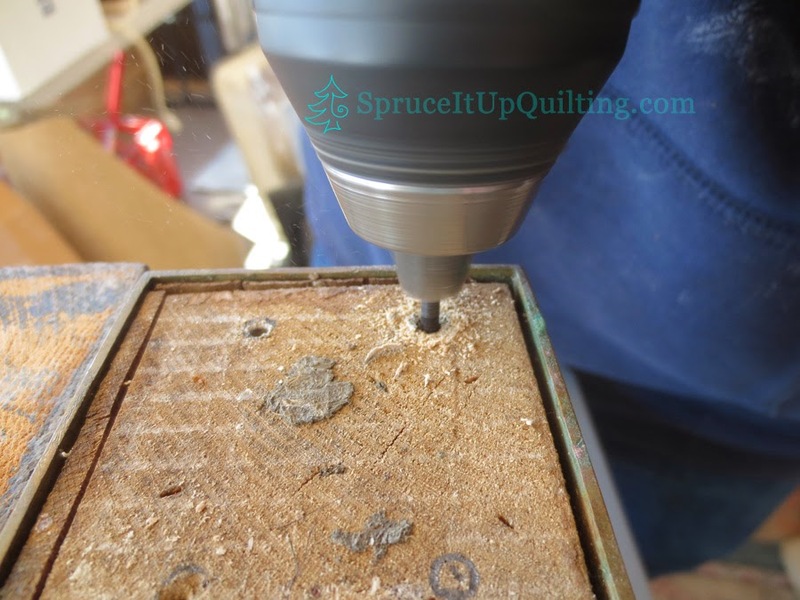 The only draw-back is that the "cap" can easily flip down and will land on your nose if you don't re-tighten the screws. I like these and despite this little drawback, I'm quite happy with them. I haven't had to use the extra lighting but I know there will come a time when I will and it will be a welcomed bonus! Details... there are plenty to deal with, to add, to adjust, to perfect when you move... one such detail was what to do with a table at which we've enjoyed many a meal here at the farm! It was a conference table we purchased in 1986 when the school of nursing across the street from us was selling their furniture before closing. It had seen better days but was still solid and serviceable. It weighs A LOT and we've moved this everywhere but to Los Angeles! Years ago we took a belt sander to the top, stained it, then added 14 coats of polyurethane. There's not a hot cup or pot that could damage it!! Indestructible! It has a few issues though... it's a little high for a dining table although that's what we used it for; and it's too low for a proper cutting table; it hurts the back! So what to do with this table??? 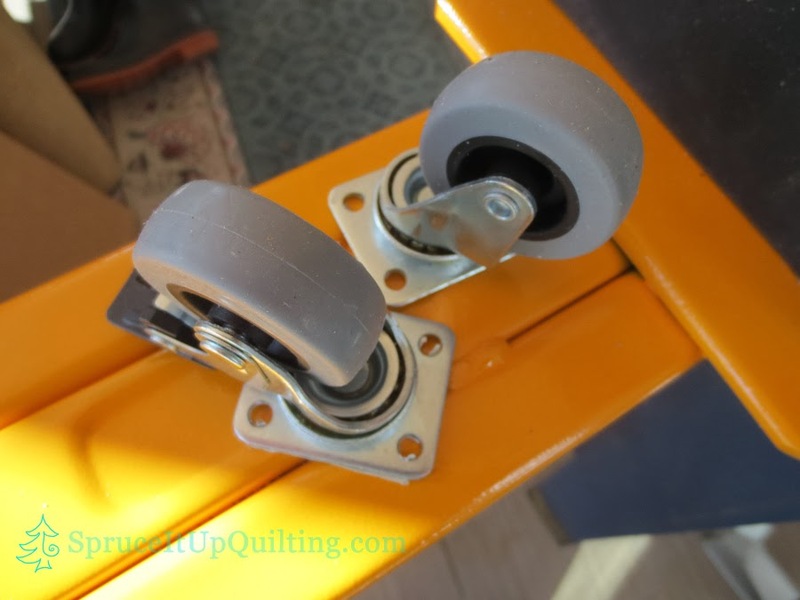 We didn't want to get rid of it... it was perfect for cutting fabric at a proper height... so we added wheels! 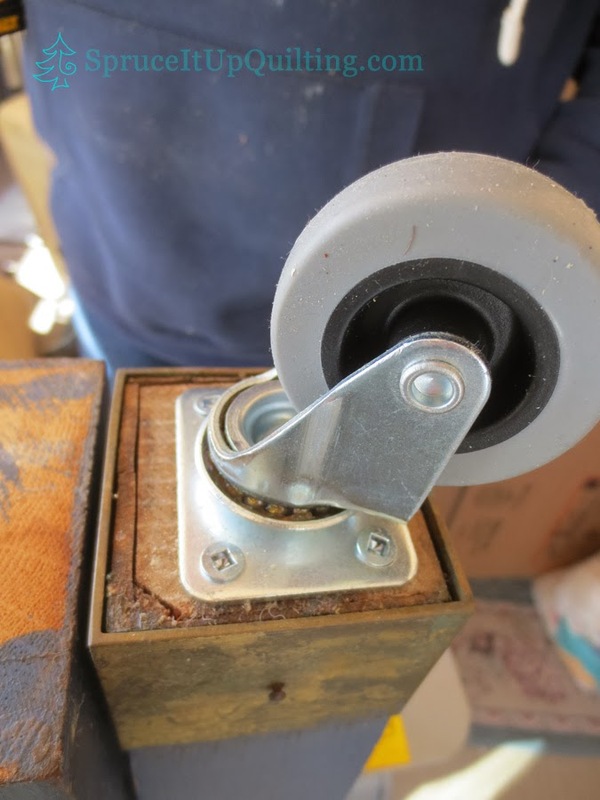 Swivel and locking wheels. I love it! I can spread out my projects and fabric and cut away... I believe I might want to add an ironing station at one end but I'll wait awhile before deciding that. Details... little ones make me happy! It doesn't take much! Looking at the bay last week when fog rolled in on the bay! Interesting phenomenon!! Just another detail... but boy! Am I happy to see it! lots of work going on.....very nice. Thank you Marjorie. I can't begin to tell you the work involved, but we're getting there. Lovely table and the design wall is brilliant! Thank you Elle. Little room for a big one here so this will have to do for now! Thank you for visiting the blog. Yes! I'll let you know if that ever happens Jennifer! All those improvements are wonderful, Lorette! Especially admire that beautiful table! Congrats! Thank you! We have loved that table since 1986! What a buy at $50! Love of wonderful memories around it! I am still visiting the blogs on the GYB circuit and have enjoyed the time I have spent here today. The snow is beautiful outside your house. You came up with a good solution for hiding one area when not in use and creating a display area at the same time. Your work table is fabulous. 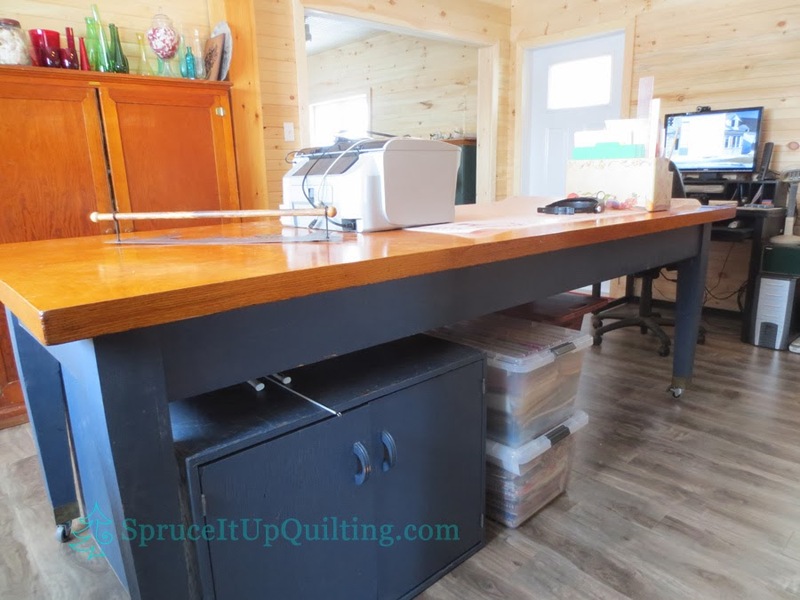 I use the large island in my kitchen a lot for cutting fabric and laying out patterns when I am working on a sewing project. I had my nephew to build it for me and it also has wheels on it. It is the perfect height for someone with back issues , like me. I live in South Carolina and am also retired. I am a wife, mother, grandmother and love sewing and all sorts of crafting techniques. 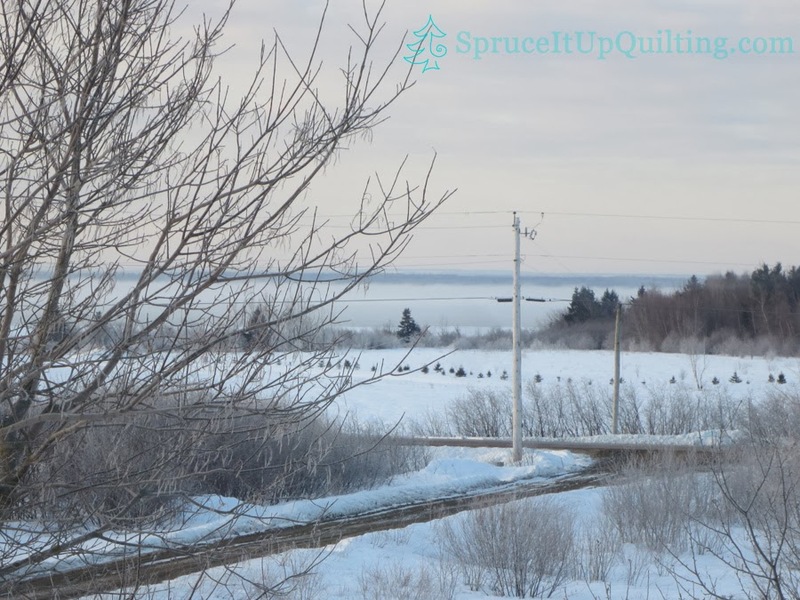 I am signing up to follow your posts and it would be so nice to have you visit my little eclectic blog and check things out. Wishing you a beautiful and blessed week! Welcome Lynn! I too am still visiting blogs from GYB although I haven't had much chance to do so lately. I've visited yours and will follow you too! Thank you for your kind comments!